By now you've heard about the Nepal earthquake. The barest facts: It was an enormous earthquake in a densely populated area of a very poor nation. We don't need to recite other facts & stats about the destruction and death toll, because the media is pumping plenty of that out to us all. It's been tough to see the news coverage. This terrible disaster hit a nerve for us in a big way. 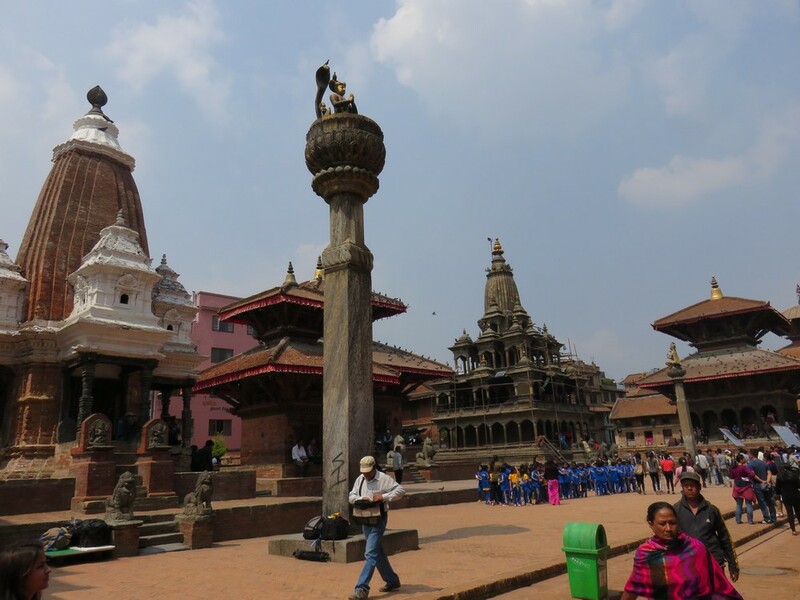 We left Nepal just about two weeks ago, and it was a country that affected us profoundly. It's one of the most naturally stunning and extreme places in the whole world. The people of Nepal are incredibly gracious hosts, and are so proud of their unique country. The Nepalese are some of the most hardworking, friendly and positive people that we encountered during all of our travels. And the country is filled with a beautiful religious devotion, yet there is great respect and tolerance for all religious views. From centuries-old temples to the clanging of prayer bells, spirituality fills the air in Nepal as much as incense. You can just feel it when you're there. And of course, we were deeply struck by witnessing the nation's poverty. The infrastructure and general conditions were just (for lack of a better word) shocking at times. By our western standards, anyway. There are no words to express the sad mix of sympathy and grief we are feeling right now for those in Nepal. It's terrible to see photos of the ancient temples--much more than UNESCO sites or tourist attractions, but sacred houses of worship for many people--now leveled to the ground. We are horrified to imagine the hardworking shopkeepers, restaurateurs, hotel managers, tea house owners, and tour operators that we met, whose businesses may now be in rubble. To think of the many tourists and trekkers, trapped where they are... we can envision how frightened and foreign they must feel, unsure of where to turn for help. And it's too awful to visually scroll through the rolodex of faces of all the people we met along the way, and to wonder who lost their home, who is injured, or worse. Luckily, we have been able to contact our guides Nihkil and Raj, and both are alive and safe. We don't know much else about the safety of their families or homes. Both men are married young fathers of baby girls. Unnervingly, we have not been able to secure confirmation of safety from our sweet porter, Narendra, who we spent 10 days with. And we also have two trekking friends, fellow New Yorkers Chris and Mana who remain uncontacted, with their safety checks unconfirmed. They were on the Annapurna circuit at the time of the quake. Our small circle of personal concerns is of course at the top of our mind, but knowing that these 5 people and their families represent just the tiniest fraction of a percent of those affected is what weighs heaviest on our hearts. Our thoughts are with everyone, and we hope and pray for news of their safety. The photos below are our own photos, taken just a few weeks ago, side-by-side with photos others took from the past few days. You can click on each photo for an expanded view and caption. It's all just so... heartbreaking. The photos and reports from Nepal are just unimaginable. The quake's impact leveled many parts of the capital city of Kathmandu and also affected Nepal's second-largest metropolis of Pokhara; both cities were the bases in which we just spent our time in Nepal. The quake's immense force sent landslides and avalanches tumbling down across the Himalayas, during peak tourist season which means thousands of hikers and climbers on Everest, Annapurna, and many other popular hiking and climbing routes. Water and electricity lines have been compromised, and the aftershocks and lingering damage/threats of collapse are forcing the entire population into the streets and other open areas. Even the wounded are being treated outside of the hospital on the ground. Already, there aren't enough doctors or medical supplies for those injured. There is, essentially, no safe shelter. Civilians are turning into first-responders to pull fellow residents from debris and to recover bodies, sifting through the rubble with their bare hands. Looking into the near future, there will be food and water shortages. Out on the horizon even further, experts predict that there could be secondary problems associated with this, such as the outbreak of water-borne illnesses like cholera. And there is barely any news at all from rural areas. The damage and death toll in rural areas is still unknown, as no one can get to those survivors. But, the word-of-mouth reports are just awful, with fears of entire villages wiped out, and destruction levels of 80-100%. By all on-the-ground accounts, the entire Kathmandu Valley is in a living nightmare. With fresh memories of the exact ground that is now this disaster zone, we could not just watch the news and sit idly by. We want to help, and are organizing a quick 3-day fire-drill fundraiser. We hope you will consider helping by way of a small donation. We are raising money to support Team Rubicon's Nepal Aid. This award-winning small non-profit is currently mobilizing a large recon team to go into the impact zone. Their team members are highly qualified, usually former military men and women, many with medical training. They are exactly the people needed in a disaster zone. If you're interested in learning more about the organization, their website is www.teamrubiconusa.org. Chris is a member of Team Rubicon Region II. Having both participated in Team Rubicon's Rockaway-response team for Hurricane Sandy victims, we know just how crucial and deeply appreciated this outside help is. Teams of volunteers go into the belly of the disaster zone to distribute food, water, supplies, and provide much-needed medical support, labor and organization for rescue and recovery efforts. Funding first-response teams like this is a great way to ensure that your donation equals HELP NOW. And Team Rubicon needs funding now for this effort. With more funds earmarked for Nepal aid, they can send a larger team to support survivors. If our fundraising gets even one more shipment of food & supplies or one more first-responder into Nepal, that's a huge contribution. 3 DAYS TO RAISE. HOW CAN YOU HELP? If you're reading this blog, there's a 95% chance you're a family member, friend or colleage of one or both of us. Our readership here at NatureCouple.com isn't huge, because this is a blog is written for our personal community. But together, as a small community, we can do something pretty big. You don't have to give a lot at all. In fact, we're not asking that. We're asking you to give just $10. If you can give more, that's awesome, but certainly not necessary. In the next 72 hours, a small donation is all that's needed to show your support. AND.... WE WILL PERSONALLY MATCH YOUR DONATIONS! We saved aggressively in order to finance our travels, setting up a “trip fund” that we used exclusively for our road expenses. Now, as we near the end of our journey, thanks to good budgeting and bean dinners, it seems there's a little left in the pot—this will now become our matching fund. There's a little over $1000 in there. For every donation to this Nepal Aid fund, we, Chris and Carrie Albanese, pledge to match it. So, let's drain that account, people! When you pledge $10, we will pledge $10 more in your name. If every person who subscribes to or reads our little blog donated $10 each, we could quickly raise well over $2000 just like that. In just 3 days. Together. So, will you forgo one or two lattes and donate $10? Can you get by without that manicure, and give $15? Or maybe even... skip the movies next weekend and pony up a full Andrew Jackson? But again, you don't need to give a lot. And we know many of you may have already given to Nepal Aid, and we understand. Whatever your individual situation, by giving to this fund (or any other Nepal disaster relief fund), you are making a sacrifice of yourself to help someone else. So.... when you cruise past the Starbucks on Monday or fire up your Netflix next Friday or look at your raggedly nails on Wednesday... say a little prayer or make a wish for Nepal. And know that you helped.